This is not the first season in which innovations in textiles have promised multifunctional features. The sportswear sector has become increasingly aware that outdoor apparel is overwhelmingly present in urban environments. But consumers are changing too. The times, at which different types of clothing are worn, are no longer as distinct from one another as they were, since the actual lives of city dwellers include activities before and after business, which demand appropriate apparel, but without a complete change of wardrobe. So much so, that the (mostly black) functional jacket, worn over a business suit, has almost become a uniform for the fashionable male. Alongside this, environmental awareness is also increasing. The performance of modern textile materials must encompass a broad spectrum, in order to accommodate sporting activities seamlessly into every day routines, as part of a sensible work-life balance. Consumers expect their everyday clothes to exhibit some of the functionality that they know from outdoor sports: the ability to keep them warm or cool them down, breathability, stain and dirt resistance, durability and wear resistance, ease of care, UV protection or high visibility through the use of reflective materials, e.g. for riding a bike in street traffic. In response, Schoeller Textiles AG from Switzerland are offering a high-quality denim with a reflective thread woven into it. A classic cross-over from the company is “Corkshell”, an ultra-lightweight fabric coating from cork waste with significantly improved insulation properties, particularly suited to use in sportswear, e.g. from The Lost Explorer or traditional cross-over jackets in the city. The latest developments from the ‘Cordura®’ brand also aim to combine the best of both worlds – high-performance with fashion, strong with soft, fashion with function and durability with stylishness. When it comes to sustainability, there is a particular focus on finishing products. The challenge for manufacturers is to develop and use sustainable, ecologically acceptable alternatives. Be it ‘ecorepel®’, also from Schoeller, or ‘Bionic Dry Eco’ from the German company Rudolf GmbH, these finishings are free of polyfluorinated chemicals and are, nevertheless, extremely effective. Concerns about nature conservancy and the disadvantages of down garments in wet weather have encouraged the development of ball fibre fillings. 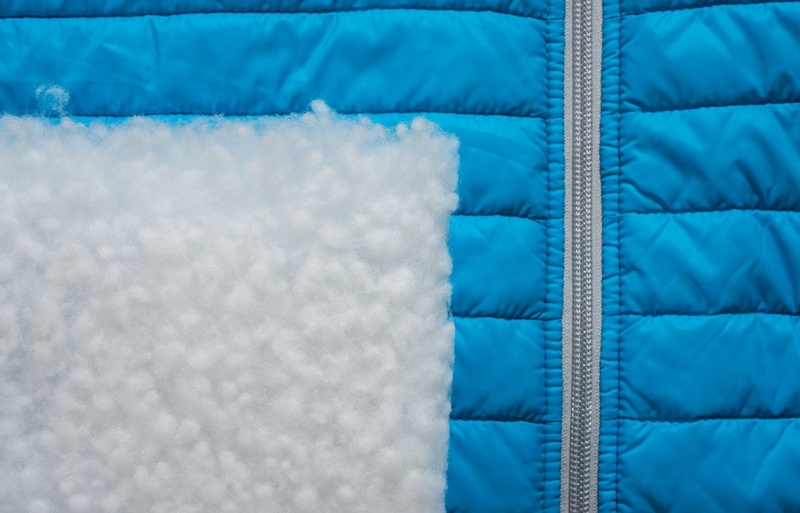 The ‘comfortemp® fiberball padding’ from Freudenberg combines the advantages of loose down filling and wadding made up of cohering fibres, particularly with regard to greater ease of use in the manufacturing process. This gives designers the greatest possible freedom and facilitates the functional cross-over between sport and fashion over a broad range of items. These innovations in new textiles, together with the latest, state-of-the-art manufacturing technologies, will all be on display at Techtextil and Texprocess, the leading international trade fairs for technical textiles, nonwovens and flexible materials, from 9 to 12 May in Frankfurt am Main.